Government publishes draft bill banning animal circuses. A number of animal welfare NGOs and several hundreds of people who have been protesting against animal circuses breathed a tentative sigh of relief earlier this week when the government published draft regulations to ban wild animals from circuses. The draft regulations address a long-standing bone of contention and seek to prohibit the use of “wild animals” for performances, exhibitions and shows and also ban the training of animals for such a purpose. It is also proposed, logically enough, to ban the advertising and/or promotion of animal circuses. The draft regulations – Prohibition of Wild Animals in Circuses Regulations – published by the Ministry for Sustainable Development, the Environment and Climate Change – define a “wild animal” as “an animal that is a member of a species not normally domesticated in Malta”. According to the draft regulations, anyone contravening the regulations will be liable to a prison term of up to a year and a fine of between €30,000 and €50,000, the cancellation of their permit and closing down of the circus. Moreover, upon conviction the court will also have the power to order treatment and the relocation or forfeiture of wild animals that have been used in circuses, with related costs to be borne by the convicted party. The public will have four weeks, until 1 December – just in time, presumably, to have the ban in place for the now annual festive season animal circuses – to make their representations to the minister responsible, stating that they believe the proposed regulations do not sufficiently protect the interests of animal welfare or that they feel the regulations are excessively restrictive. International Animal Rescue (Malta) submitted its proposals when a consultation paper was issued two months ago. We also had a meeting with the Parliamentary Secretary responsible for animal rights and discussed the issue thoroughly. The migration season started with large numbers of bangs and shots owing to the sudden change in the weather in the early days of September. Large flock of birds flew over Malta, particularly birds of prey and herons and flamingos. A number of these were shot down and the police also made some arrests but still the promised enforcement is lacking, particularly during the week. News continued pouring in from Gozo and yesterday sources next to the police stated that a man had been arrested and was being questioned after a considerable number of stuffed protected birds were found in his residence in Xaghra, Gozo. The police raided the house following a tip-off. They found 80 undeclared stuffed protected birds in his collection and a number of others were also found in a freezer. According to the same source they included flamingos, ospreys, kites and storks. MEPA Environment officials are compiling a list of the finds. Following these incidents, a car which is being used by a group of researchers working on the Malta Seabirds project was shot at several times where it was parked in Gozo. This car is well known to the hunters because it is being used frequently. The Malta Seabird Project is funded under the EU Life project. The researchers heard the shots but because they were at the edge of the cliff quite far away from their car they did not recognise the person shooting. They realised that their car had been shot at when they returned about two hours later. 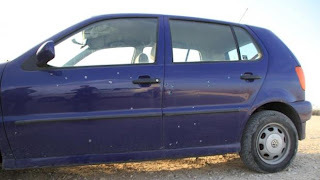 Apart from the marks from the lead pellets the car also had a number of dents. 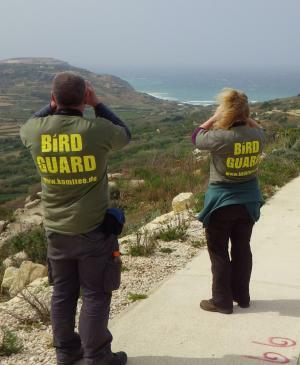 The Bird camps on Malta and Gozo started earlier this month. 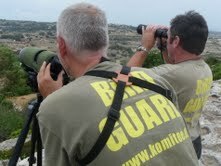 The Birdlife camp commenced a week ago while the CABS camp started on Friday 13 September. On Sunday shortly after midday two poachers shot down a strictly protected Black stork in the Valley of San Blas where lot of shooting takes place. The bird was still alive when it was recovered but died soon after it was handed to the Gozo Police Patrol which was called to the scene. The bird was a juvenile born only a few months ago and was on its first migration to its wintering quarters in Africa. The report was triggered by a witness who saw the shooting and reported the case. Since the arrival of CABS on Gozo the patrols in Gozo have been beefed up and are working hand in hand with the CABS camp guards. A spokesman for CABS said they were grateful to the person who alerted the guards and also to the prompt intervention of the Gozo Police because such action is important to curb illegal hunting. The illegal shooting which took place on Saturday was followed by a number of illegal killings of protected species the following day on the north islands. Observers saw hunters killing honey buzzards in the Buskett Area, whilst other reports of shooting at birds of prey were received from various areas in the south of Malta. CABS guards filmed a number of attempts to kill protected species and also reported a trapper in the Mgarr area to the police . Trapping is allowed at this time of year but the trapper was using illegal clap nets. In all, in a short period of three hours CABS reported six illegalities. The 40 guards from various countries in Europe will be in Malta for the next three weeks. The annual operation run by the German group Committee Against Bird Slaughter (CABS) to protect migrating birds from being shot illegally on the Island of Malta starts this weekend (14 September.) This year the group includes more than 40 volunteers from nine countries. The guards taking part in the camps will be stationed on both Malta and Gozo. The main aim of the CABS teams is to deter the shooting down of protected migrating bird species. Its bird guards will also search for illegal bird traps, nets and electronic decoy devices and report them to the law enforcement agencies. CABS said it welcomed the announcement by Parliamentary Secretary Roderick Galdes that more than 100 police officers, including mounted patrols, will be deployed to combat poaching this autumn. CABS President Heinz Schwarze said that everyone was delighted to hear that the Administrative Law Enforcement unit (ALE) was at last being reinforced and will now hopefully also be capable of more proactive action against poaching. In this connection the group praised the professional work of the ALE unit and the Gozo police, which led to the arrest of flamingo killers earlier in the week. The CABS team will include a number of professional ornithologists and biologists with considerable field experience in various countries in Central and Southern Europe. They will be open to having contact with members of the public and ready to discuss or advise on ornithological or environmental matters. The operation will continue until the end of September and will be conducted in close co-operation with International Animal Rescue Malta, BirdLife Malta and the Malta Police Force. The CABS teams on Gozo will be supported by members of the German Foundation Pro Biodiversity (SPA), which is also supporting the camp with a significant financial contribution. The Malta government has announced the autumn hunting season and revealed that the hours of the mid-season curfew will be reduced. The news has been welcomed by the FKNK, the hunters’ federation, as the government’s first step towards the eliminating the curfew, which it said was imposed on the hunting season. However, environmental and animal welfare groups have strongly criticised the government for not protecting migrating birds from illegal hunters. The Government stated that, on the recommendation of the Ornis Committee, the season will open on 1 September and close on 31 January for hunting on land and open on 1 October for hunting at sea. The dates are unchanged from previous years but a curfew after 3 pm between September 15 and 30 has been reduced. The hunting of birds on land shall be permitted during two hours before sunrise and two hours after sunset on any day between Monday and Saturday and during two hours before sunrise and after 1pm on Sundays and public holidays. However hunting on land between 15 September and 7 October will not be permitted from Mondays to Saturdays after 7pm, nor during the two hours before sunrise of the following day. This action is a clear confirmation that the government is gradually giving in to the hunting lobby and has no environmental conscience whatsoever. Max Farrugia, Chairman of International Animal Rescue in Malta, said: “This is not an electoral mandate because I could not trace it in the electoral manifesto but might be part of the talks which the hunting lobby group and the government had before the elections. I am convinced that this legal notice regarding the hunting season will give a green light for more illegal hunting even though the government has insisted that the police and army will be joining forces to curb the illegalities and that there will be zero tolerance. Farrugia added that everyone knows that Maltese hunters are very difficult to control and in his opinion this is why hunting was not allowed after 3 pm. The Coalition for the Abolition of Spring Hunting (CASH) which was set up a few days before the legal notice was issued, condemned the government’s decision to reduce the hunting curfew between 15-30 September by four hours. A spokesperson for the coalition said this was a clear sign that there was little interest from the government in ensuring the conservation of migratory birds over the Maltese Islands. 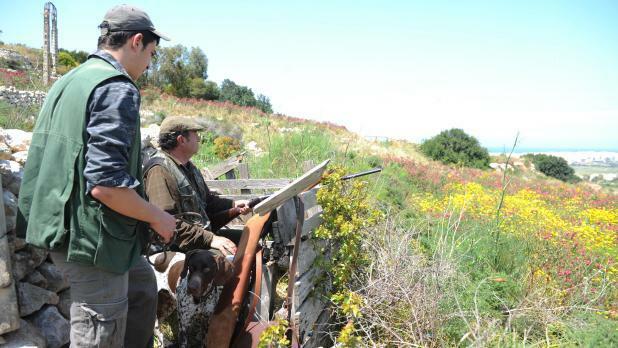 The coalition urged the Maltese public to sign its petition calling for a referendum to ban spring hunting. "This is an opportunity to show that the Maltese population cares for wildlife, bird conservation and democracy," it said. During recent days shots have been heard in the south of the island in the notorious areas of Zonqor Point and Marsascala. The first migrating birds have already started to pass over Malta and already the first victim has been brought in - a night heron with an injured wing. Three flamingos were also shot down when a flock flew over Malta and some of them tried to make a stopover. With the help of some local residents the police managed to trace the killers and those who helped in the killing of one flamingo in Gozo and five people were arrested. The bird was found in a freezer. According to eye witnesses the bird was shot down and fell in the sea where it was retrieved by a hunting dog. The 'Coalition for the Abolition of Spring Hunting' (CASH) has formally launched a petition calling for the holding of a referendum on the abolition of spring hunting. The coalition is made up of the Ramblers Association of Malta, Nature Trust, Moviment Graffiti, International Animal Rescue Malta, Greenhouse Malta, Gaia Foundation, Friends of the Earth Malta, Flimkien għal Ambjent Aħjar, Din l-Art Ħelwa, Coalition for Animal Rights, BirdLife Malta and Alternattiva Demokratika. In order for the referendum to be called at least 34,000 Maltese who are eligible to vote in a general election must sign the petition. The petition for the referendum cannot be signed online. Copies of the petition are being made available from cashmalta2013@gmail.com or from the members of the Coalition mentioned above. Members of the coalition complained during the press conference that both major political parties had committed themselves to protect spring hunting. Max Farrugia from International Animal Rescue Malta said that during the election campaign protection of spring hunting was one of the issues but soon after the elections the new government removed the €50 special licence fee and identification armbands for registered hunters. As a result there were 50% more registered hunters during the spring hunting season of 2013 compared with 2012. It is worth noting that spring hunting is possible in Malta through a derogation of the EU Birds Directive. Hunting is allowed in spring for Turtle Dove (Gamiema) and Quail (Summiena) but both have become species of conservation concern because their numbers are declining so rapidly in Europe, the coalition said. Continued hunting in spring put Malta at risk of action such as fines from the EU. It was stated in the press conference that "From a conservation and hunting point of view it makes no sense to hunt birds that are returning to their breeding grounds. These are the birds that have survived the winter and would replenish bird populations if they reached their breeding grounds. 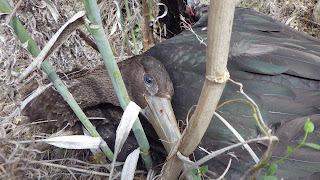 Killing them in spring is therefore unsustainable." Maltese bird trappers who had high hopes that they would be allowed to start trapping during the coming October and November, have been told that this year there will be no finch-trapping but that the government is preparing for next year’s season. The trappers were notified by the Hunting Federation FKNK that the autumn season for finch-trapping would not be opened this year. According to the FKNK a delegation met the Environment Minister Leo Brincat and Parliamentary Secretary for Animal Rights Roderick Galdes earlier this week and was informed of the government's decision. In order to pacify the angry trappers the Federation argued that the government didn't have enough time to apply this year's derogation correctly and preferred to work on next year's, rather than do things hastily and risk receiving a total ban from the EU. However, the Federation assured its members that it had submitted its proposals in plenty of time to both the government and opposition for the correct application of the derogation which would allow Malta to open the autumn season. This indicates that the Federation is putting the ball firmly back in the politicians’ court. Last year, the governing Nationalist Party applied a derogation of EU law to allow the trapping of song thrush and golden plover, a decision which was contested by the European Commission. During the election campaign the labour Government had raised high hopes among the hunters and trappers that a derogation would be sought. The angry trappers feel betrayed by the politicians. In a meeting I had recently with the Parliamentary Secretary for Animal Rights he made it clear that any illegal hunting would be met with zero tolerance. In any other country the garrique habitat of the Ta' Cenc plateau,The Ta’ Cenc Plateau, an extensive rocky garrique biotope poised high on towering cliffs above the clear blue Mediterranean, would be a treasured and protected habitat for flora and fauna. Not least because its cliffs are home to a large colony of Cory’s Shearwater, a rare seabird species.However recently a pair of Peregrine Falcons - the original ‘Maltese Falcon’ - also attempted to nest there but were shot by hunters. Situated on Malta’s small sister island of Gozo, it has become an unsupervised adventure playground for hunters and trappers from Gozo and Malta, most of whom have the aim of trapping or shooting down anything that flies. Until the Committee Against Bird Slaughter (CABS), with whom IAR works in Malta to combat illegal hunting, decided to take a stand! After negotiations with the landowner Mr Victor Borg, who also owns the 5 star Hotel and Spa at ta Cenc adjoining the plateau, CABS were issued with a written authorisation to ask unwanted trespassers - in particular hunters and trappers whose activities are forbidden on Mr Borg’s private land - to leave and not come back. This was one of the most important achievements since CABS arrived for their annual bird protection camp. The plateau is a paradise for ground roosting birds on passage. In addition to large flocks of Barn Swallows, House Martins and Swifts that criss-cross the area feeding on the plentiful insects to be found in the garrique, the bushes and grasses offer overnight cover for birds of prey such as Marsh and Montagu’s Harriers. Groups of song birds including Whinchats can be seen flitting from bush to bush, Bee-eaters and raptors pass overhead and, from time to time, the looping flight of the colourful Hoopoe delights the passer-by. And, in addition to the other tourists and local nature lovers, who would appreciate this bi-annual spectacle if the presence of armed hunters and skulking trappers did not sully the natural beauty, are the residents of the adjacent Ta' Cenc hotel. Instead of the peace and quiet associated with a holiday in an otherwise exclusive rural location, horrified visitors from other European states are almost literally ‘blasted’ out of bed by gunfire that begins before dawn and goes on unrelentingly until well after the breakfast room closes. Emboldened by the presence of the CABS and SPA Bird Guards in their distinctive T-shirts in and around the hotel, a delegation of guests approached the owner and asked him what action could be taken to rescue what was left of their not inexpensive holiday on Gozo. The answer was to hand. The negotiations with the CABS team leader on Gozo were swiftly concluded and, over Mr Borg’s signature, authorisation was given to members of the CABS and SPA teams to exercise domiciliary rights on behalf of the owner. Before dawn the following morning seven Bird Guards, accompanied by local supporters to cope with any language problems, assembled at the entrance to the property. On the previous evening the Gozo police had been alerted in case of any trouble but they were to remain in reserve and act only if aggression was shown towards the Bird Guards. With one exception, which was dealt with by our competent local guides, this was not the case. After initial deployment around the perimeter by vehicle the teams swept across the plateau on foot. Seven hunters (one clearly a trapper with a live decoy Turtle Dove but no nets set out) were accosted and politely asked to leave private property. Where necessary our written accreditation was shown and explained when the hunter was unable to understand legal English. One became very excitable but was calmed down somewhat and sent away. On weekdays up to 12 hunters can be expected, but the high winds did not favour hunting. More can be expected at the weekend when many Maltese hunters cross on the ferry to hunt on Gozo. CABS efforts were concentrated on the hunters so a detailed search for trapping paraphernalia was not carried out. Nonetheless decoy cages and pull wires were found in various locations and either removed or destroyed on the spot. Some shooting hides, most of them containing hunters,’ litter were rendered unusable. The clearance of foreign material and restructuring of the former hides (with due regard to ecological aspects) is a mid- to long-term follow up task. On the following morning CABS and SPA teams manned the entrance gate and conducted a visual control of vehicles entering the property. No hunters attempted entry, but several vehicles were seen to approach the entrance and turn around. At about 7.00 am two vehicles entered and reported to us that they were representatives of the FKNK (spring hunting monitor) and MEPA. We informed them that the Ta’ Cenc private property area was free of hunters and advised them to monitor the valley to the south-east where shooting had taken place since dawn, which they then did. A number of local people and tourists entered the area for their morning walks, remaining on the marked tracks. Ta’ Cenc property will continue to be monitored by CABS until the end of the bird protection camp, particularly this coming weekend (27/28 April) when hunters may arrive who are not aware that the owner’s rights to ban hunting and trapping are now being exercised. The general public and tourists appear to be well satisfied with the ‘hunting free’ zone. It is hoped that the ecology of the area, both flora and fauna, will profit in future from the lack of disturbance, reduction in lead pollution and removal of litter and foreign materials - including hazardous waste. Spokesman Max Farrugia for International Animal Rescue in Malta said that they are aware that the rights of other landowners on Gozo and Malta to ban hunting and trapping on their property are often abused and difficult to enforce. A proper land owned register is very important to make things much easy for those responsible for the Order in the country. He expressed the opinion that anyone with a gun on private property must have a written authorisation that he is on the site with the permission of the land owner, or that the land is rented to him.